Set up in an old warehouse in downtown Portland, the market’s vendors fill the first two floors while the food carts are arranged just outside. The market is open to all ages, and admission is free. 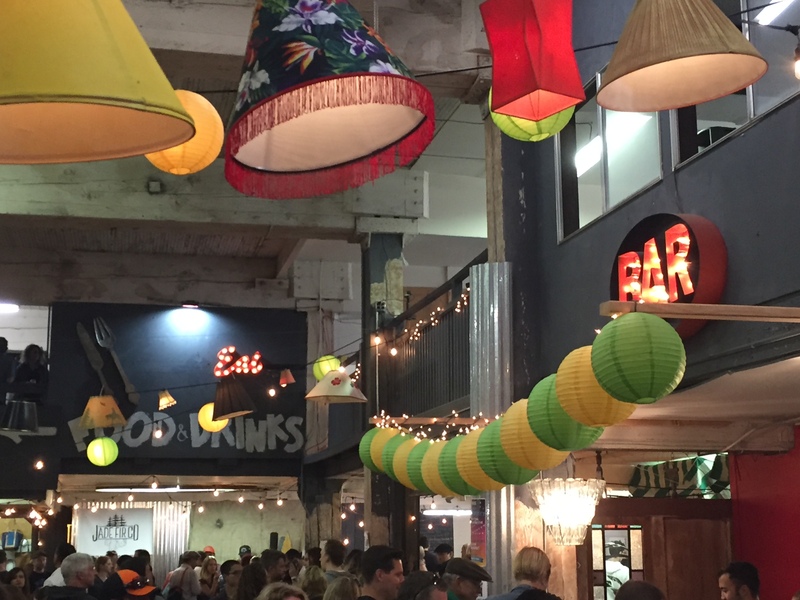 This quarter the Night Market will bring a mix of over 175 vendors – and lots of people. Strollers aren’t allowed, and due to the crowds, we wouldn’t recommend bringing young children. Parking can be really tight, too, so consider taking public transit. All kinds of things are available for perusal and purchase: art and alcohol, sauces and sweaters, even baubles and baked goods. It’s kitschy and cozy and crowded all at the same time, but it works – with a very Portland vibe. Lots of tasty food choices, and samples, too! There are many free food samples and lots of great items for sale, and the people-watching is terrific! We saw folks of all ages there, and Jeff’s 70-something parents enjoyed it, too. The decor and lighting make for a festivalish atmosphere, and, besides, who doesn’t like shopping with a drink in their hand? We definitely recommend a visit to the Portland Night Market, whether you live in Portland or are just visiting for a week or a weekend!